As the road starts to rise at the northern end of Ao Chao Phao you’ll see the clearly signposted Benjamin’s Hut on your left, offering modern, smart rooms running down to the beach. Average rating 8.6 from 238 reviews. They finish at an equally smart polished concrete restaurant that overlooks the beach and is a good spot to relax through the midday heat. Both the restaurant and rooms are from the polished bare concrete school of thought and while the rooms are fairly close together, they’ve been well fitted out with wooden reclining bench seats, bamboo table settings and a hammock on the deck area to make them feel as homely as possible. 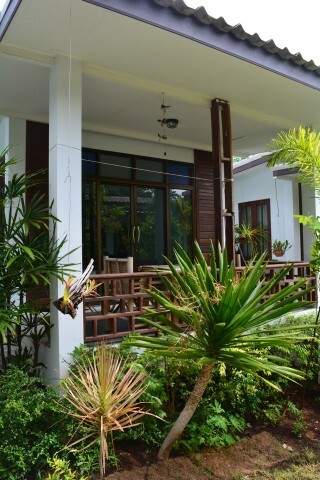 Inside the rooms is equally spartan – firm bed, polished tile floor, very clean and modern bathroom and chilled air-con. The bungalows have glass sliding doors meaning that as they are right by the walkway, passers by can see straight into the room, but there are some gardens that help give a little privacy and, as there are not that many rooms, we wouldn’t expect too much passing traffic through to the beach and restaurant anyway. If you’ve a flashpacker budget, like the modern polished concrete style and don’t need a swimming pool, then you’ll most likely be pretty comfortable here. If you prefer a pool, consider the nearby Sunset Cove. Check rates at Benjamin's Hut on Booking.com.